Many outdoor adventurers have a favorite piece of gear they always have with them. 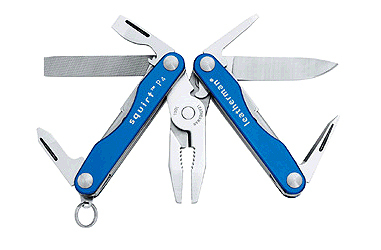 For me, it’s my Leatherman Squirt P4. Like MacGyver and his trusty Swiss Army knife, I rarely leave home without my Squirt. After receiving it as a gift about five years ago, it’s been in my pocket nearly every day. At 2.25-inches long and weighing just 2 ounces, it packs a pliers, knife, wire cutter, bottle opener, file, three different screwdrivers and a pointless awl. I’ve used the file for fingernails and metal darts, the needle-nose pliers as a tweezers, the regular pliers in place of a wrench, and the screwdrivers when it’s too much work to fetch the toolbox. Then there’s the bottle opener, which is a necessity, and the knife, which always comes in handy. Another thing I like: Unlike its bigger brothers, everything but the Leatherman’s pliers and wire cutter are accessible with the tool closed. The stainless steel tool is incredibly durable and, despite putting it through some tough trials, I’ve never felt like it was going to break. I have, though, bent a few teeth on both the needle-nose and regular pliers while trying to use it as a wrench, and I’ve learned the Phillips screwdriver isn’t meant for tough jobs — I’ve tweaked a portion of the head while trying to loosen a tough screw. However, I’ve also torqued the drivers quite a bit in the past five years, and they’ve held strong. Portland, Ore.-based Leatherman has a reputation for making quality multi-tools, and, while often overlooked, I think the Squirt P4 ranks near the top. The company even made the tool in pink (in addition to the red, blue and grey), and Leatherman offers versions with a scissors and a wire stripper — though the pliers wins hands-down in my book. Pros: Compact; Functional; 25-year warranty; Has stood up admirably to five years of use in my test. Bottom Line: The P4 is a go-everywhere, do-everything tool that waits small and unnoticed in your pocket until you need it.